Chihuahuas are naturally made for cuddling close, it seems; what happens, though, when your furry friend has skin problems? Itchy, scaly, scabby, flaky, oozy or smelly skin not only make your little pup miserable, but can also be a turn-off for us as owners, too. Like any other dog breed, Chihuahuas can develop dermal disorders that might keep us up at night as they lick or chew incessantly, and skin issues can cause our Chis to become lethargic and unhappy because they’re quite literally uncomfortable in their own skin! 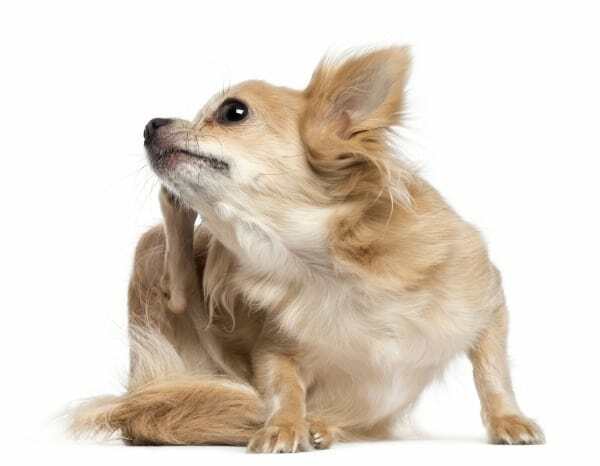 Let’s take a look at some of the common skin problems that Chihuahuas can face, and what your vet might suggest to help your little pup return to health again. This is a very common issue for our canine companions, no matter what their size. Some dogs are highly allergic to the saliva that enters their skin from flea bites, causing a skin inflammation that result in redness, scabbing, and intense itching – not fun! Even one or two fleas can cause a reaction like this, so prevention and treatment for these pups usually involves consistent monthly flea control that actually kills adult fleas before they can bite your dog. Because Chihuahuas are tiny and can be sensitive to some types of over-the-counter parasite products, it’s best to check with your vet about which type of prevention is safe to use. Mange is actually caused by microscopic parasites (mites) that live in your dog’s skin. There are two types of mites that can affect our pups – the Demodex mite, which causes demodectic mange, and the Sarcoptes mite, which causes sarcoptic mange (or scabies). Mange can either affect just a small area of the body (localized mange), or in some cases, spread over a dog’s entire body (generalized mange). Although the signs of mange can be slightly different, depending on the mite, mange tends to cause hair loss, redness, and sometimes intense itching, crusty sores or thickened skin. 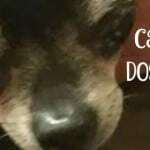 Your vet will usually perform a simple test called a skin scraping to diagnose mange on your Chihuahua, and there can be a few different ways to treat it. You might be asked to use a prescription mange dip or shampoo on your pup, but oral medications or topical drops like Revolution may be recommended for treatment as well. 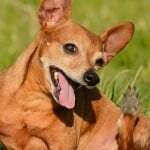 For most dogs, treatment usually spans weeks, if not months. For our poor pups that may have developed a secondary skin infection, antibiotics are often part of the treatment plan as well. Vacuuming, washing your dog’s bedding and toys regularly are important to help control mange during treatment, and if Sarcoptes (scabies) is diagnosed, a check-up with your own doctor might not be a bad idea, since it can be transmitted to people. 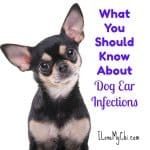 A bug bite that’s been scratched too often or a minor scratch that’s given bacteria a major opportunity; these can be two reasons why a hot spot can happen to your Chihuahua. Hot spots are red, moist areas, often with oozing discharge or crusts, that usually happen when something has irritated your pup’s skin and skin bacteria has been given the chance to cause an infection. Your furry friend’s chewing or licking of the area only introduces more bacteria and makes the infection worse, sometimes causing it to spread quickly within a day or two – a really uncomfortable situation for your Chi! Treatment can involve clipping the hair around the area, cleaning the hot spot, antibiotics to control the infection, and sometimes medication like corticosteroids to help control the itching. 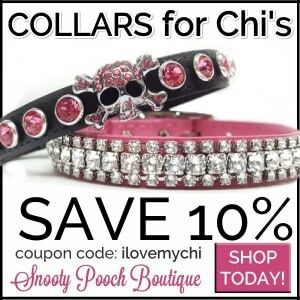 It’s safe to say that many Chi owners are all too familiar with the distressing effects of allergies. A good number of our petite pups suffer from reactions to substances like grass, pollen, dust mites, and mold; allergies to certain food proteins can be pretty common too. For dogs and pet parents alike, the chronic problems caused by allergies can be a constant source of suffering, causing red, itchy skin, stained fur from chewing or licking, rashes, scabs, ear infections and hair loss. To complicate the situation even more, some dogs do have reactions to more than one allergen, causing a compound effect for our poor dogs! Allergies can be diagnosed through skin tests, allergy blood tests, or elimination food trials, but for the majority of our furry friends, there’s no actual ‘cure’ for chronic allergies – only management. 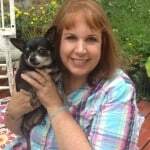 Treatment might involve a different plan of action for each dog, including food changes, different bathing routines, medication, and reducing exposure to environmental factors, chemicals and foods that we know can cause our Chihuahuas grief. Often causing a distinct smell and a greasy feel to your Chi’s skin and coat, yeast overgrowth tends to happen in warm, moist areas like their ears, neck folds and groin area. Small amounts of this microorganism normally lives on your pup’s skin, but sometimes, if the skin is already irritated or compromised (by allergies or parasites, for example), then yeast can take the opportunity to multiply, causing its own set of problems. Since yeast is microscopic, your vet might swab or scrape your pup’s skin to check for yeast overgrowth, and treatment usually involves solving any underlying health issues that might be already affected your Chihuahua, as well as medicated shampoos, ear rinses or sprays to help control the spread of yeast. 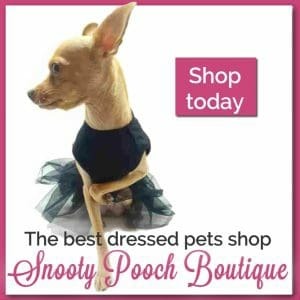 Long lasting skin problems can definitely be a frustrating situation for some Chihuahua lovers, but there are a few other things that you can do as well to help support your tiny tail-wagger’s immune system and skin health. 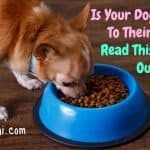 Feeding a high quality, complete and balanced food helps your dog to maintain a soft, shiny and healthy coat, as well as a good dermal and digestive barrier against allergens and other irritants, while regular grooming and ear care for your Chi can help you spot problem areas earlier, often making treatment easier on your little dog. I have also found that adding a little coconut oil to their food helps with dry skin. You can even rub it into their dry skin too. With the right combination of vigilance and care, we hope your Chihuahua can avoid the discomfort of chronic issues over their lifetime! Jax n daisy shampoo and lotion has helped my baby!I bathe her twice a week and apply lotion after each bath.I swear by it! What kind of lotion do you use K.C.? Hello I’m Candy with two 8 yr. Old chis. My husband keeps bathing almost every other day because they lick,scratch and rub themselves on the carpet. I tell him we need flea meds. And all this bathing is only irritating them. He spends our money on different shampoo (which I could use to buy flea meds.) It’s either him or the dogs now. If he keeps this up can the oil help? I. Was giving them an egg every other day but he said too expensive. Again what kind of oil and where to get it? Thanks for any help you can give me. Yeah he is definitely bathing them too much and is probably making their condition worse. They shouldn’t be washed more than once every few weeks, specially in the winter. I just use coconut oil that I buy at Walmart in the baking section. I rub some into their skin and add a little to their food a few times a week too. As for eggs being too expensive, for the money, they are one of the best values out there. What does an egg do? Eggs have certain amino acids in them Gary, that if we (or our dogs) don’t have enough of those acids, it can cause dry flaky skin. Do you cook the eggs or give them to the dogs raw. Mine will not eat them raw. Yes, I’d cook them. Mine love them scrambled. All dogs need flea protection. Try a topical called Dermascent. It’s applied behind the,neck like flea meds. It’s for dry itchy skin. I haven’t heard of Dermascent before. I’ll have to look into it. Is tea tree oil ok for dey akin? Tea tree oil is better for skin infections and fleas. I’d use coconut oil for dry skin. If you do use tea tree oil, you really need to dilute it as it’s too strong and can hurt your dog if used full strength. That looks like it could have gone into a skin infection. You need to get your baby to a vet. They will probably give them antibiotics and a skin cream. The Jax n Daisy lotion. Oh duh, just re-read your original comment and saw you said shampoo AND lotion. My girl Godiva has had allergy problems and the itching that goes with it most of her life. I changed vets about a year ago and the new vet suggested half a pill of Apoquel every day. This has been a miracle pill for her. That’s really interesting Nick! Thanks for letting us know about it. It could be allergies or mites or one of the other things mentioned in the article. He should probably see a vet. In the meantime give him a bath with an oatmeal shampoo for dogs to help soothe his skin. You can also add a little coconut oil to his food and rub it into his skin. That will help if it’s just dry skin. I wouldn’t use mineral oil, if you can avoid it. It’s a petroleum product and may cause secondary irritation. Petroleum oils eliminate the skin’s ability to “breathe”. Try coconut better- but better for the skin and especially if he licks. Good point. Coconut oil is wonderful for dogs and humans too. Hi. I was petting my 11 yr old chi yesterday and I noticed a small bump on the back of her neck. When I look at it, it was actually a scab and the skin was a little red and moist. What do u think could have caused this? I cleaned it and put a little neosporin. She has a bandana on now so she doesn’t scratch. It sounds like it could be a bug bite Mary Ann. What do u suggest I do? I’ve cleaned the area and put neosporin. I’ve never dealt with this before. Sounds like you are doing the right thing. Just keep an eye on it. If it starts looking infected or gets a red streak coming from it, get her to the vet. Poor Peanut! She sounds like she’s very allergic to something. You may want to make her food for awhile and just feed her things like cooked chicken, canned pumpkin and beef. Keep grains away from her. They tend to bring on allergies in dogs and many commercial dog foods have them in them. Also, if you want, I can share your question on our facebook page. Maybe you can get some more ideas what to do from there. Let me know. My chihuahua, Leela, has boils in her underbelly, sometimes disgusting growths that look like skin tags. She also started losing patches of hair. See attached picture. Do you think this is allergy, fungus or bacteria? Or whatever it is? I use a medicated shampoo that is antifungal and antibacterial but it does not seem to help. The poor dog looks at me as if begging for help. Please let me know right away. Please? Ouch! Poor little girl, that looks painful. I’m not a vet so I can’t really say what that is but it definitely needs to be seen by a veterinarian. Are there any signs of fleas? The smaller welts look kind of like flea bites but the fact that she has those big ones too, makes me think it’s something else. If you can’t afford a vet, check to see if there are any veterinary colleges within driving distance. They will often provide treatment for free or greatly reduced charges. You can also see if your local SPCA has a veterinary clinic for the public. Ours does and it’s much cheaper than a regular vet. Please, though get her in to see one soon. I think that’s the only thing that can help her now. You could try a cortisone cream like Cortizone 10 or Benadryl cream in the meantime to provide her some comfort. Equal parts of water and vinegar rinse,after shampooing may help. It’s worth a try Vickie. Hi, chi, is having skin issues too, I put cortisone, I just started with that, about the have a oatmeal shampoo for him, but coconut oil, i can put it all over him, or just the belly? Hi Liz, your chi’s belly looks very familiar. My chi gets more of them on her back. Vet seen it and nothing. One day I gave her my other dogs food that’s for dog with food allergies. Her skin started to get way better. Her hair even started to grow back. Hill’s Prescription Diet z/d in can. Your vet can give you a Rx or sometime they sale it. I also give my dog Halo vegan formula. Only try Halo vegan after your dog’s system has been detox with the Hill’s z/d food. I hope this helps you and other. my chica is scratching like crazy and rubbing on the carpet. She is mostly scratching her back at the bottom of her tail. Her skin is red and irritated. Any home remadeis, cant aford vet. Baby Alex is a total cutie Diane!